Due to the intersections of oppression, Femme of Centre folks and particularly as Folks of Colour, cash poor and different abled folks experience oppression that is rarely named and that we are often blamed for. Femme of Centre folks, and particularly in queer community are often accused of ‘colluding with the enemy’; that our gender expression exists because we are simply conforming to patriarchal expectations. While there are varied experiences of privilege possessed by femmes of centre, in a sexist, racist, ableist, capitalist, heterosexist society, we also experience nuanced oppressions. While affirming our agency, we will with care explore how oppressed communities that we are a part of participate in the perpetuation of oppression as a means to maintain and assert power – this plays out deeply due to femmes role in domestic relationships, and often underpaid, undervalued work positions. 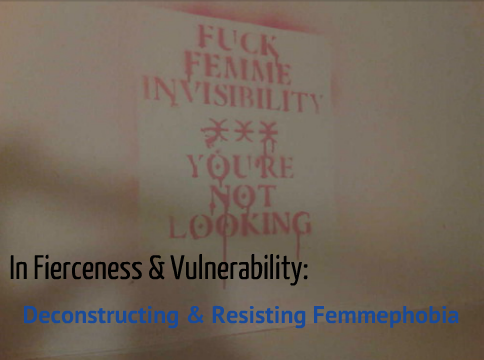 This workshop will name the systemic and historical context of Femmephobia that informs our contemporary experience in North America. Complicated by social location, we will learn from the others in the room of their lived experiences and also share our collective strategies of resistance. We will acknowledge the radical and imperfect perfect nature of self-care, vanity and adornment for femme-of-centre folks. We will not seek to reconcile our identities, experiences and methods, we will collaborate without compromising our integrity in the workshop and we create art in order to close the session. We will celebrate each other in our resilience and resistance beautifulbrokengorgeous as we are. Click the image above or here for a link to the presentation that accompanied this workshop.